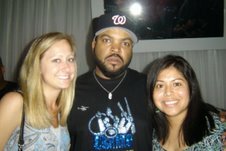 Ice Cube was on fire Monday night at Myst, where he showed up shortly before midnight to promote his upcoming album, “Raw Footage,” set to be released Aug. 19. My friend, who works for Quick, a Dallas Morning News publication, invited me and two other girls to join her for the event. As someone who likes old school rap, I couldn’t help but want to go to the club and have my picture taken with the 39-year-old hip-hop star. Ice Cube had a fierce and bewildered look in his eyes, and I never once saw him smile when in the company of his paparazzi posse. I laughed, though, while taking my picture with him. There I was, still dressed in my not-so-fashionable work clothes at a trendy night club with Ice Cube for an event I had just heard about hours before. I couldn’t help but love the spontaneity.